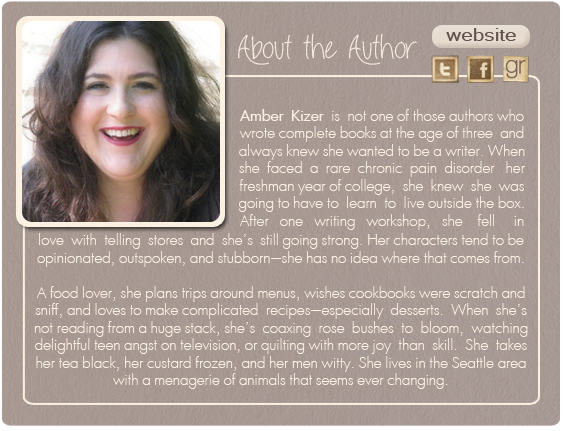 Today I have the enormous pleasure of welcoming author Amber Kizer to the blog as part of our Spook-tastic Halloween event! 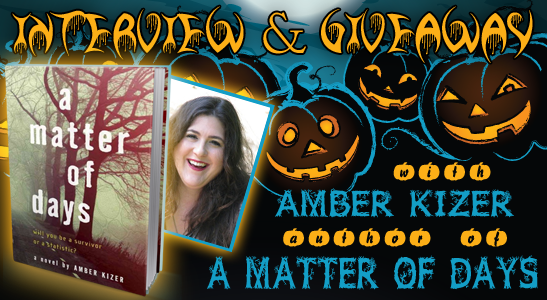 Amber is here to talk about her recently released YA post-apocalyptic thriller, A Matter Of Days, and share with us her favorite Halloween-y reads and spooky stories! I absolutely LOVED A Matter Of Days. It was recommended to me by my friend, Tiffany, and boy, was she right! This book was completely amazing, deeply bone-chilling and so damn engrossing! It's one of the best books I've had the pleasure of reading this year, and I keep on wishing there was a sequel! Click here to read my review!!! I also have the pleasure of hosting a giveaway of one audiobook version of this fantastic book, so be sure to scroll all the way down and enter! :) Trust me, you want it!!! Hi Amber! It's a great pleasure to have you stopping by the blog today! Thanks for taking part in our Halloween Event. And a HUGE congratulations on your latest release, A Matter Of Days! Amber: Thanks for having me! I’m so glad you enjoyed AMOD! 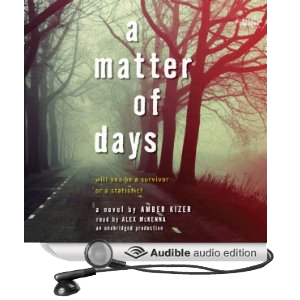 A Matter Of Days is a deeply bone-chilling and thoroughly gripping realistic survival story and I loved every minute of it! Can you tell us a little bit about the inspiration behind it? Amber: Thank you! Stephen King’s THE STAND was hugely inspirational and pivotal in my life when I read it in middle school. It was one of the first stories that resonated with me. I think I’ve always had that dream of waking up alone or being stripped down to the bare bones of guts and determination and seeing what people do. Then when I read THE HOT ZONE by Richard Preston I got completely addicted to virus and pandemic nonfiction. At one point I seriously thought about working in research on the deadliest viruses around the world in laboratories at the CDC, NIH, or WHO. Viruses are very fascinating. 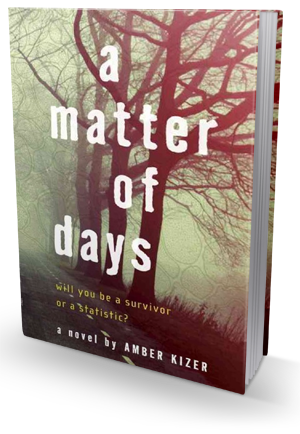 The premise of A Matter Of Days is incredibly fascinating and downright scary - a deadly pandemic that took down 98% of world's population, two young survivors, and their desperate struggles to reach the safety of their grandfather's survivalist compound located all the way across the country. I was literally glued to the pages and could not stop reading! What were the challenges in bringing this story to life? Did you have to do any research for your book? Amber: First, I do an insane amount of research for all of my books, so yes I have notebooks and notebooks of bibliographies, research, and notes. There were two challenges that come with stories like this—one is to take the readers on a trip they want to go on and second to write a story in such a way that’s it doesn’t sound like the teens had special ops training. Can you share with us a few of your favorite quotes from A Matter Of Days? Amber: That’s like asking me to pick my favorite child. Amber: Aside from hoping that readers have a good time and are entertained if they walk away thinking about how they too can be the cockroach that would be awesome. Halloween is almost upon us. To me that means horror movie nights with popcorn, tricks and (hopefully) stacks of yummy treats, and, perhaps most of all, the chance to scare someone and experience the thrill of being scared myself. What does Halloween mean to you? Amber: I love carving pumpkins with my friends and family. Amber: I was once on a plane that caught fire. I got to slide down those fun slides. That was memorable for being bone chilling. What are some of your favorite scary stories? Any favorite horror or thriller books/authors? Amber: I’ve already mentioned Stephen King. I also loved WAIT TILL HELEN COMES and SCARY STORIES. What's the scariest / most memorable horror movie you ever saw? Amber: I watched Poltergeist and the Chucky movies as a tween/teen. I couldn’t drink that last swallow of milk for years and checked to see if my dolls had moved an inch for months after! 1) If I was magically transported back in time to the Dark Ages, I'd... Die quickly because I always get sick and medicine would be of no help. 2) I'm a pro at... Having conversations with people I don’t know. 3) I'm addicted to...Iced tea. 4) I'm scared of... Stupid people. 5) The last book I faked reading was... Shhh, it won lots of awards and I have no idea why! Last question: I'm super curious and I'm sure your fans are all wondering about it too: are you working on a new book now? If so, when can we expect it? Can you share some juicy details to keep our appetites going? 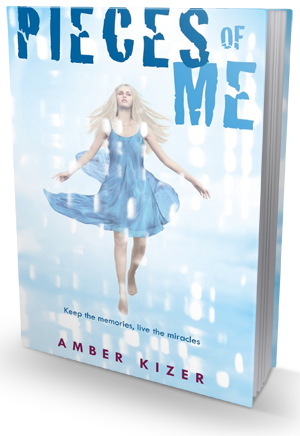 Yes, the next book comes out February 11th, 2014 and is called PIECES OF ME. It follows Jessica who is an organ donor as her life connects with the teenage recipients of her pieces. I’m attaching the cover art—feel free to share it. Thank you for stopping by, Amber! Expected publication: February 11th 2014 by Delacorte Press.